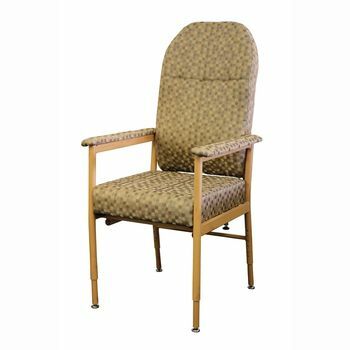 Lounge style high back utility chair. Adjustable seat height and depth. Removable back for ease of transport. Wood look aluminium frame, making the chair lightweight and strong. Sculpted backrest provides full lumbar support. Recommended for household and dining activities. Available in 45cm, 52cm, or 60cm seat widths. Range of vinyl or fabric choice available.